CNBC is a US based English language basic cable, satellite and internet news channel that primarily focuses on business, which is owned by NBCUniversal News Group. The Channel was founded in 1989, it mainly offers daily coverage of both US and international financial markets during business hours, and investigative documentaries to occupy the later time slots. Outside the financial world, CNBC also provides sports coverage by acting as an overflow feed for NBC Sports. Since 2000, some of the sports that have been covered include both the summer and winter Olympics, the Champions Tour (Senior PGA), and NASCAR. 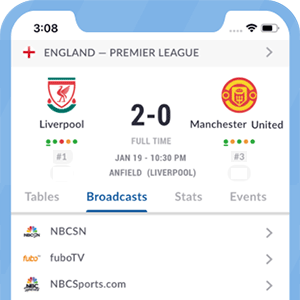 For soccer fans, CNBC channel is typically is used as an overflow channel when other NBCUniversal channels do not have available slots for EPL matches, or also on days where there are many games simulcast such as the last match day of the English Premier League. CNBC can be accessed online via CNBC.com and CNBC Pro, which is an additional subscription-based service, but both are meant for those interested in the financial happenings around the world. Tune into CNBC on DirecTV on Channel 355 (SD/HD). On Dish Network, you can watch CNBC on Channel 208 (HD/SD) or 9439 (HD). On AT&T U-verse on Channels: 1216 (HD), 216 (SD); On Verizon FiOS on Channels 602 (HD) and 102 (SD); On Google Fiber on Channel 121. The station is also available on Sirius XM Radio on Channel 112. *Got itLive Soccer TV does not provide CNBC live streaming. The information provided on this page is simply CNBC soccer TV schedule.